Record enrollment has spurred construction of both a residence hall and academic center, both scheduled to open next fall. 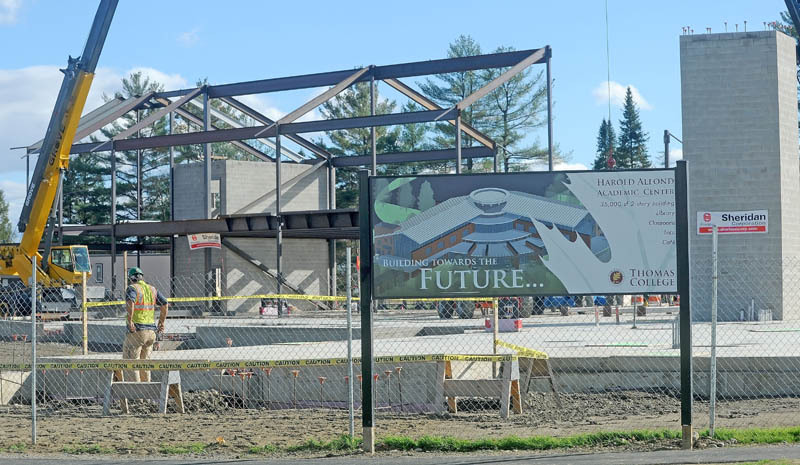 WATERVILLE — Students at Thomas College said Friday that they are excited to see their campus grow, and college officials say that’s largely because more students are coming from outside New England and other countries. Enrollment at the school reached a record high this fall with 297 full-time students enrolling in the class of 2017. The increase means there is more need for housing and academic programs, which the college is meeting with the construction of two buildings — a residence hall and academic center, both scheduled to open in the fall of 2014. “Everyone knows everyone here. It’s a small community, but we are also really hopeful that the campus will grow in the future,” said Nick McCann, a senior sports management major from Canaan. On Friday, McCann was one of several students and faculty and staff members who gathered to celebrate the construction of the Harold Alfond Academic Center, a 36,000-square-foot building that will house classrooms, a library, faculty offices and a peer tutoring and mentor center. The college also is building a 108-bed residence hall as part of a four-stage master expansion plan. About two-thirds of students live on campus. College President Laurie Lachance, who is beginning her second year at the school, thanked benefactors and welcomed this year’s freshman class to campus. Enrollment of first-year students at Thomas has increased about 16 percent since 2008, when the incoming class had 254 students, according to college spokeswoman Jennifer Buker. The full-time student population is about 800 students, while in the fall of 2010 there were about 700 full-time students. The college has been preparing for growth since 2011, when it unveiled a master plan to construct about a dozen buildings and simultaneously increase enrollment to 1,200 to 1,400 students. Lachance said the college is ahead of its targets and that too little residential space is available to house incoming students, although the new residence hall will help meet some of that need. A large part of Thomas’ growth can be attributed to an increase in students from international students and students outside of the New England region, she said. According to the state Department of Education, the number of high school freshmen who enrolled in Maine public schools declined from 17,403 during the 2006–2007 school year to 14,688 in 2012–2013. And while Thomas College has grown, the University of Maine System reported in September that there has been a roughly 3 percent decline in enrollment from the 2012–2013 school year to the current school year. On Friday, faculty members, students and alumni at Thomas said they were excited about the additions to campus and talked about what they think are the reasons the campus is growing. Todd Smith, co-chairman of the board of directors and a 1992 graduate of the college, said much has changed since his time as a student in the early 1990s, when enrollment was down drastically and the college did not have a strong fundraising base to stabilize finances. Construction of the new Alfond center was funded in part by the Harold Alfond Foundation, which provided a grant through which it matched each dollar the college raised toward construction, up to $4 million. The foundation, named for philanthropist Harold Alfond, is known for its investments in education, health care and other charitable causes in Maine communities. Smith said he considers Thomas to be stronger than ever today, with more students, faculty and staff members who are available outside the classroom, and alumni who are leaders in their fields in central Maine. He advised students that if they want to help Thomas continue to be successful, they should pursue their dreams and stay connected to the college. Pamela Thompson, chairwoman of the faculty senate and associate professor of education, said the gathering Friday was a celebration of the work faculty members do with students every day and of the college community. One of the college’s symbols is an oak leaf and an acorn, which Thompson said is a reminder of the college’s strength as well as its vibrancy and growth. “The plans for the academic center will provide much-needed space for students and faculty to engage in the work of transforming lives — not only for current students, but for future students we will welcome,” Thompson said. Current students, including Student Senate President Jasmine Turner, said they couldn’t wait to have their first classes in the new academic building. They said they chose Thomas because they liked the close, tight-knit community. “It’s a small-community feeling,” said sophomore Phyllicia Jordan, of Waltham. A criminal justice major, she said another reason she chose to attend Thomas was its guaranteed job program, a program by which the college agrees to pay the student loans of qualified students who have not found employment within six months of graduation.